The Royal British Legion has launched an augmented-reality experience that brings to life the stories from the Battle of Passchendaele in a bid to reach a younger audience. Created by Geometry Global UK, the initiative expands the success of the "Every pin tells a tale" campaign created in which British artillery shell fuses and earth samples were collected from Passchendaele battlefields and melted down to create 60,083 poppy pins to honour and remember every British soldier who fell during battle. Sales from the campaign help generate income to provide lifelong support to all members of the British Armed Forces, veterans and their families. With AR partner, Blippar, Geometry has created an experience that's triggered by these pins. 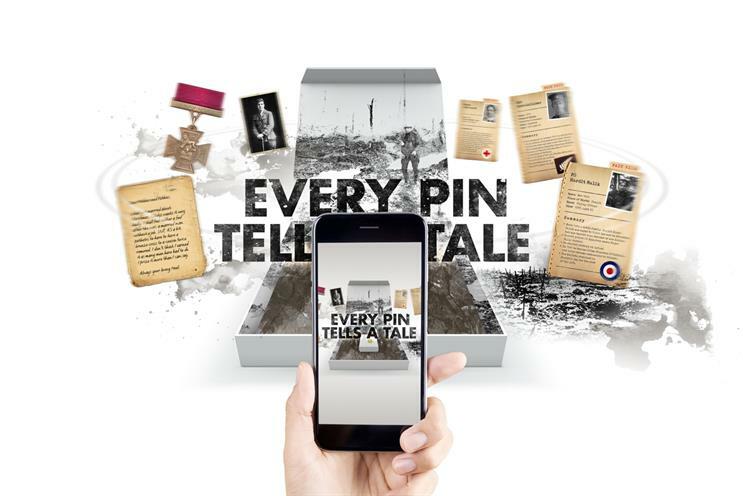 Each pin comes in a commemorative box which, when scanned with the Blippar app, transforms into a muddy trench giving just a glimpse of Passchendaele as you hear the stories of the fallen. Blippar and Geometry worked with RBL to understand the product and its story, Omaid Hiwaizi, global head of experience strategy at Blippar, said. "That's how we've managed to create a portal into the world of the soldier in a muddy trench." The creative director for this experience was Geometry's Jez Cripps and the head of digital was Debbie Ellison. One story tells of Captain Noel Chavasse, a British medical doctor and Olympic athlete, the only British serviceman awarded a Victoria Cross twice during the First World War. Hit by shell splinters in 1916 while rescuing men in No Man’s land, it is said that Chavasse got as close as 25 yards to the German frontline where he found three men and continued throughout the night under a constant rain of sniper bullets and bombing. With similar heroics in the early stages of Passchendaele in August 1917 he was awarded a second VC and died two days later. "By blending sharp human behaviour insight and popular technology, stories from a century ago are brought to today’s audience helping create a much better understanding of experiences the brave sustained." Karl Turley, business director at Geometry Global UK, said.